The recovery tools included in Microsoft Office are practical but not very efficient. That is why, the software Easy Office Recovery has been designed. It can restore any documents. Recovering: This restoring tool was optimized in order to allow the user having back his office documents. It can recover Excel spreadsheets, PowerPoint presentations or Word documents. To do this, it is equipped with a restoration algorithm. 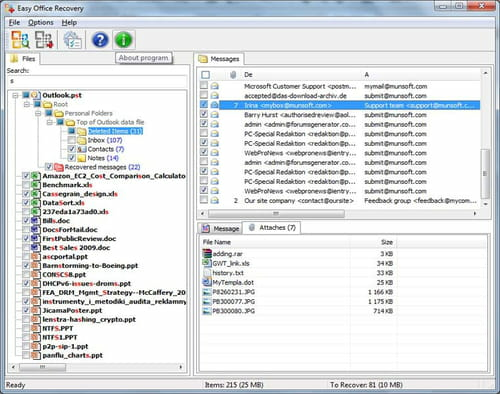 Outlook: Easy Office Recovery also gives his help to the Microsoft Outlook user. In fact, it has the ability to recover the messages, the appointments or even the lost contacts. Restoring process: This tool offers the user a simple way to recover his documents. All he has to do is to launch the scan, choose the partition he wants to analyze and finally select the files he wants to restore. Previewing: What makes Easy Office Recovery interesting is its ability to show the user the files before the process. Once the scan is over, it displays on the main window the contents of a message, document or a presentation. Easy Office Recovery is easy to use. It has a full Unicode support. Latest update on August 21, 2015 at 05:51 AM.